While the size of Merida makes a complete listing impractical, everyone makes there way to el centro and the Zocalo. 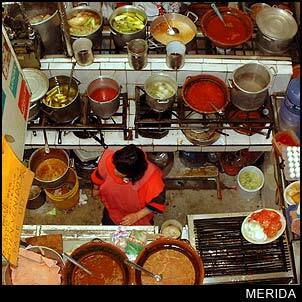 So we will concentrate on Merida restaurants to try while you are visiting the historic center. Located on Calle 59 near 62. This is actually a bar which serves specialty coffee and has a menu which includes entrees like fajitas. Located on Calle 59 near 44. Regional Yucatan/Mexican dishes at very reasonable prices. Located on Calle 57 between 60 and 62. Good regional Yucatan/Mexican dishes including several seafood dishes. Located on Calle 60 between 57th and 59th. A good restaurant with moderate prices and a nice view of the park. Open for dinner . . . call 999-928-1928 for reservations. Located on Calle 61 near 66. Good Mexican and Yucatan dishes at reasonable prices. Located on Calle 59 between 60 and 62 just north of the Plaza Mayor. Moderately priced Yucatan and Vegetarian dishes. Located on Calle 45 between 64 and 66. This seafood restaurant is moderately priced with tasty dishes. Located at 493 on Calle 50A. Regional Yucatan dishes at reasonable prices.